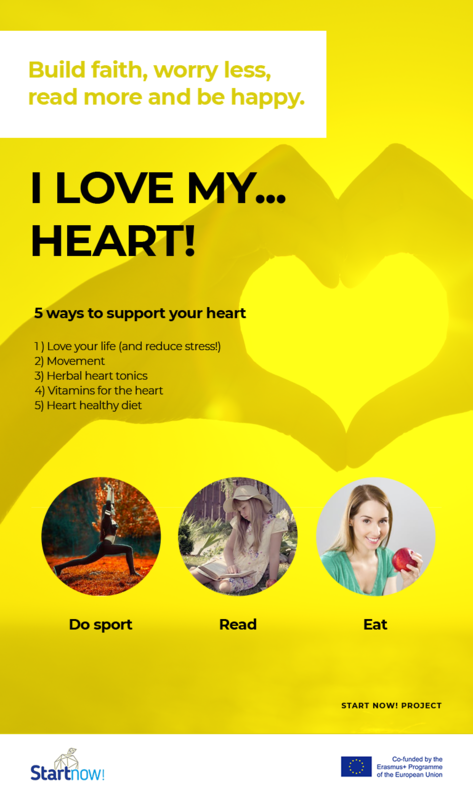 I love my… Heart – Start now learning! Materials: the story, enough space, music, etc. Make sure that there is enough space for all participants. Make sure that the environment is safe. Shoulder rotations (holding your arms straight out to the side, and move your arms in a circular motion, making bigger circles each time). Materials: Appendix 1 (Infographic), paper, sheets, pens, flip chart, PC, etc. The Facilitator presents a short presentation about the topic (or can use the Module’s infographics or a suitable video from internet), and then proceeds with a short discussion based on the following question: “What are the ways to really love your heart?” Participants can write their ideas on small sheets in heart-shape and stick them on the flipchart. to state why they connected to each word the way they did? What was easiest to find – positive or negative statements for our hearts? What is considered as the greatest risk of cardiovascular disease in the country each participant originates? Appendix 2: "Tell me about my heart"
Materials: paper, sheets, pens, flip chart, PC, etc. Ideas for physical activity in kindergarten, school, workplace, university, etc.? How the physical activity is good for the body and the mind, in the target groups mentioned in the previous question? After 15 minutes, each group is asked to present their work along with a good practice which people can adopt in their daily lifestyle. The Facilitator splits the group into two teams and distributes the following questions/tasks. How can sport and physical activity solve problems related to cardiovascular diseases? Create a campaign or event based on sport or physical activity among people with cardiovascular problems. Describe who can participate in the campaign or event (athletes, students, disabled people, people with obesity, people with different religions). Create a campaign or event based on physical activity or sport among 18-35 year old people. Who can participate in the campaign or event (athletes, students, disabled people, people with obesity, people with different religions). At the end, each team is asked to present their work for approximately 10-15 mins. At the end of each presentation short discussion between all participants takes place. What is common between the two campaigns? What is the difference between the two campaigns? What is the similarity between them? Who would fund such a campaign? Can people with problems with cardiovascular system and the ones with heart disease (please clarify with participants the difference if needed) do physical exercise or some sport to minimize the risk of infarction, stroke, heart disease? What kind of exercises are suitable for people with stroke – yoga, moderate gymnastic, etc.? Which sports and what type of exercise are recommended for prevention of heart diseases? The Facilitator can present to all participants useful applications that may be useful in the prevention of cardiovascular diseases (Nike+ Training Club Арр, GymGoal Pro Арр, еtс.). If the facilitator found out that the group is independent enough, they can research for the applications themselves, without giving them hints with apps names. All participants will be asked to do individual training programs with the help of the presented applications to improve their physical condition and reduce the risk of cardiovascular disease. Within two weeks, all participants will be asked to share in social networks and medias, FB group “Start now” what is the effect of these training programs. Participants will be also invited to share in social media post, photos or videos of these exercises. Participants can also find in Facebook a profile picture frame of campaign about raising awareness of cardiovascular diseases and set it in its profile for the period of the dissemination (two weeks).